Being a long time fan of this band, I was very excited to load the new Pretty Maids CD and hit the play button. With the exception of Stripped, the band hasn't released an album I didn't like. Of course, some albums are better than others, but I can say that the entire back catalog of the band is very solid. 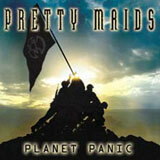 After several listens to Planet Panic, I must now unfortunately say that the Maids have disappointed me. Forgive me if this review gets a little long, but in order to give you a fair idea of what's gone bad and what's still good about Pretty Maids, I want to touch on each of the ten tracks on this album. Pretty Maids have tried to modernize their sound with some new production techniques and a slightly down tuned guitar in spots creating a much darker mood than what we have seen in the past. For example. The leadoff track Virtual Brutality starts off with some electronic sound effects, distorted vocals, and a down tuned, moody sounding guitar. Then, around the fifty second mark (and twice more throughout the song), we are treated (?) to some scratch record effects. The trademark harmony vocals are still there, but other than that, this song is sure to turn off some long time fans of the band. Up next is probably the best song of the disc with Playing God. This is a fast, power metal cut, one of the Maids' heavier tunes in recent years. The tuned down guitars take a break as do the experimental sounds of the first track. The chorus line "Playing God, playing with Fire…" is unfortunately one of the few memorable chorus lines on this CD. Next up is a mid tempo rocker (with an AC/DC style beat), He Who Never Lived. This is an average song by Pretty Maids standards as it features a decent chorus line, but not all that memorable, and the song structure is rather basic. Up next is Face of My Enemy which has a noticeable darker mood to it. There is a nice guitar solo in this song, but the Maids absolutely lose their sense of melody with this song and it certainly will not leave its mark in your mind like so many other Pretty Maids tunes. Sure, they have succeeded in creating a darker mood in this song, but somehow they have sacrificed the very thing that makes the Pretty Maids a special band - melody and harmony vocals lines the forever etch themselves in your memory. Such is the case with the next track, Not What You Think. This is another darker mid tempo song that seems to just plod along without offering any memorable moments to the listener. Some slightly more aggressive vocals are introduced in this song which actually comes across well, but like I said, without the perfect harmony vocals and catchy chorus lines that I have come to expect from the Maids, this song is very easily forgettable the second it is over. Natural High is next up and is a ballad with nice keyboard textures and a very emotional (and melodic!) chorus line that will certainly compare to earlier balladry of the band. Who's Gonna Change is up next and is another power metal song like Playing God. Unlike Playing God, this tune has the darker mood that we have been exposed to before on this album. And just like the track Not What You Think, there is nothing at all with this song that will stick with you and is again, easily forgettable once the next track begins. Following up is a lazy mid tempo tune, Worthless. Some forceful vocals again make an appearance, but the song itself is quite boring to listen to. Again, nothing memorable in the melody department, and not a single riff to catch my attention with this track. The title of the song is actually very appropriate! After my first listen, this track is where I started to lose my interest in the album and wanted to move on to something else. But anyway, moving to the next song, we find perhaps the most melodic and catchy song on the disc! Too bad it's a cover tune. The Maids have chosen Sammy Hagar's One Way to Rock to cover and do a pretty good job. They stick pretty true to the original, but add a bit of a keyboard texture to make it their own. Not a bad cover, but I prefer the raw energy of the original. Closing out the disc is a ballad, Enter Forevermore which is not nearly as good as the other ballad on the disc, Natural High. There are no catchy harmony vocals or even any worthy guitar solos to look forward to here. After the already lackluster second half of this CD, it is very easy to just eject the disc and move on to something else. So there you have it. While there are a handful of nice moments on this disc, there are far too many tracks that fail to captivate the listener (filler material). I am surely open to a band trying to update and improve its sound, but in this case, the Maids have for the most part lost their ability to create catchy songs with some of the best harmony vocals in the genre. So, in their attempt to take their sound a step forward, I feel that have at the same time taken two steps backward. Without any hooks or catchy moments to sink my teeth into, the overall sounds like a collection of "b-sides" from the last few releases of the band. If you want decent background music to listen to, this CD will serve the purpose of "audio wallpaper" very well. However, if you really want to hear some cool melodies and some of the best harmony vocals around, I highly suggest starting with the Future World and Spooked albums of this band and build you collection around those two albums. This is not a horrible CD, but it certainly falls much below the standard the band has set for itself over the last two decades.